All Things Kevyn: Happy Christmas, Hanukkah, Kwanzaa, Life Day, Festivus, X-Mas!! Happy Christmas, Hanukkah, Kwanzaa, Life Day, Festivus, X-Mas!! Or whatever other holiday festivities you happen to partake of this time of year. 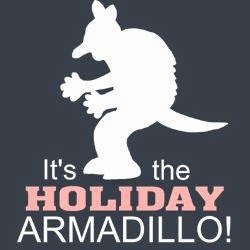 Even if you choose to take your holiday advice from a half-Jewish Armadillo. Basically, I'm wishing you a goddamn merry X-Mas, so get over it. Right now it is the afternoon of Christmas Eve (or X-Mas Eve, as I prefer) and things are about to heat up in our household, as we are about to host our 16th Annual X-Mas Eve Partaaaay! But I did want to take a second or two to wish the merriest of merriests to all my faithful readers and true believers out there. And yeah, I stole those greetings from Dorothy Parker and Stan Lee, respectively. Lately I've been working on my end of the year lists, and you will be seeing those lists within teh next few weeks. First will come My 25 Favourite Comic Books of 2014, on January 4th. After that will be My 25 Fave TV Shows of the Year. That will show up on January 8th. And then, a bit later than usual this year, will come My 25 Favourite Films of 2014. The reason that one is being held off until January 12th, is because I need to see Paul Thomas Anderson's Inherent Vice before I make said list. Anyone who knows me and my cinematic tastes, knows damn well this film is going to be on there, and probably relatively high up, so since I will not be seeing that one until January 9th, the list must wait. Anyhoo, that's enough of that. There will be lots and lots of new things coming down the pike in my blog's new year, (as well as some refurbished old things) but more on that in my New Year's Eve post. Right now, I have a party for which to prepare. No prepositions at the end of that sentence. Have a merry merry and what not. That's it gang. See ya 'round the web. 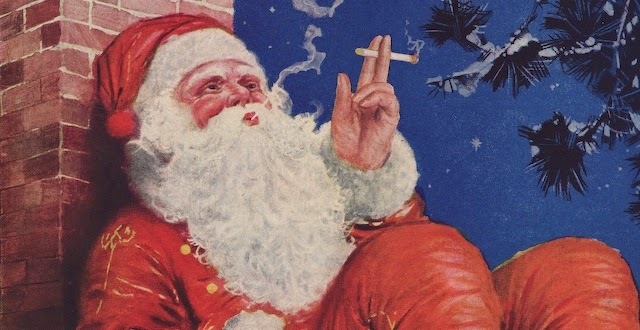 Here's a picture of Santa smoking a cigarette. Enjoy. And Happy post Boxing Day to you and yours!